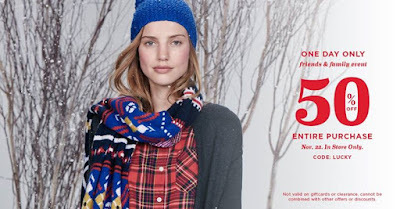 Savvy Spending: *HOT* Old Navy 50% off entire purchase on 11/22! Claim your coupon now! *HOT* Old Navy 50% off entire purchase on 11/22! Claim your coupon now! REMINDER: This is valid tomorrow! Old Navy has an offer on Facebook for 50% off your purchase on November 22! Just go HERE to see this offer and "claim it" and it will be sent to you via email. Valid in stores on 11/22 only. This is a great offer if you're looking to purchase gifts or need clothes, shoes, accessories, coats, etc for your family!